Mid Feb, one of the London VMUG leaders posted on twitter, looking for someone to present on the subject of “upgrading from vSphere 5.5 to vSphere 6.5”. So I jumped at the chance, kind of, and offered to present. This blog post covers the content from that presentation. OK, so let’s just upgrade then? Expect this to be more costly than general support. Technical Guidance for vSphere 5.5 is available until September 19, 2020 primarily through the self-help portal. During the Technical Guidance phase, VMware does not offer new hardware support, server/client/guest OS updates, new security patches or bug fixes unless otherwise noted. 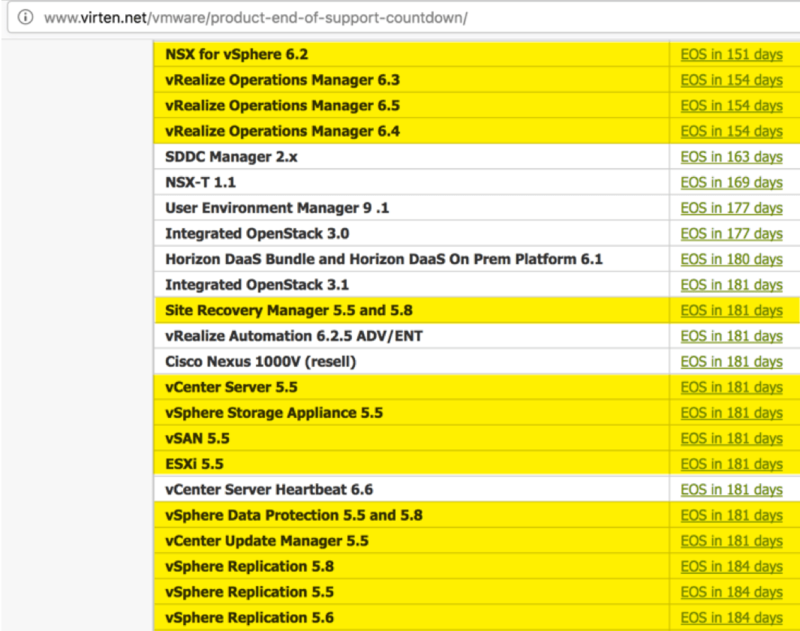 It’s not only the core vSphere 5.5 products that are affected, as we can see from the End-of-Support tracking page provided by virten.net. There are other VMware solutions that you have deployed that may also need upgrading.